I have been sitting on this pattern for several years, all while sweltering in the summer heat. I purchased my fabric easily three years ago and have been wanting a sheer dress for probably five years. Summer in multiple layers of clothing is definitely more warm than it has to be! So, this past spring, I finally decided to just do it! I have researched various patterns available on the market, including some Big Three patterns, Peachtree Mercantile, and others, but I know that Truly Victorian makes beautiful, accurate, and easy to follow patterns, which is why I settled on this one. 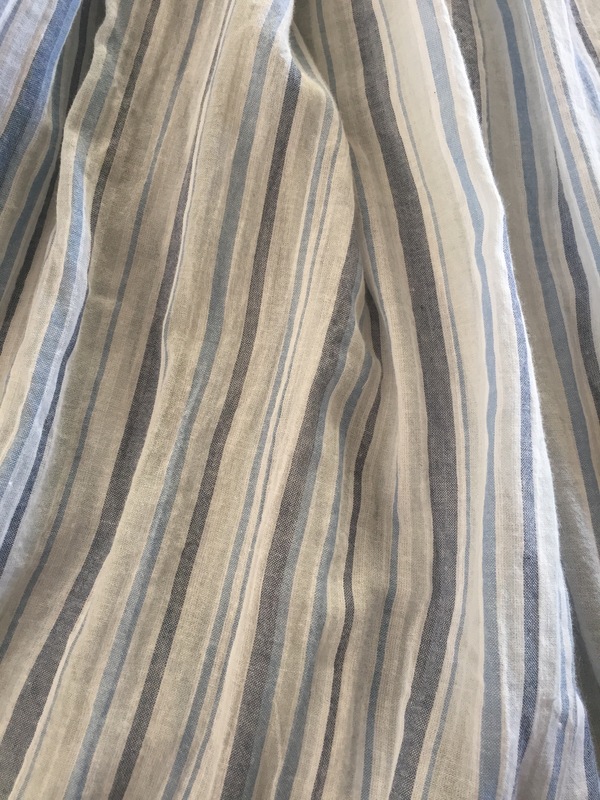 I chose a lovely sheer cotton in blue and white stripes that I found on clearance at a chain store. I know of more than one person who has made a sheer of this fabric. Hopefully we won’t all be at the same event together! 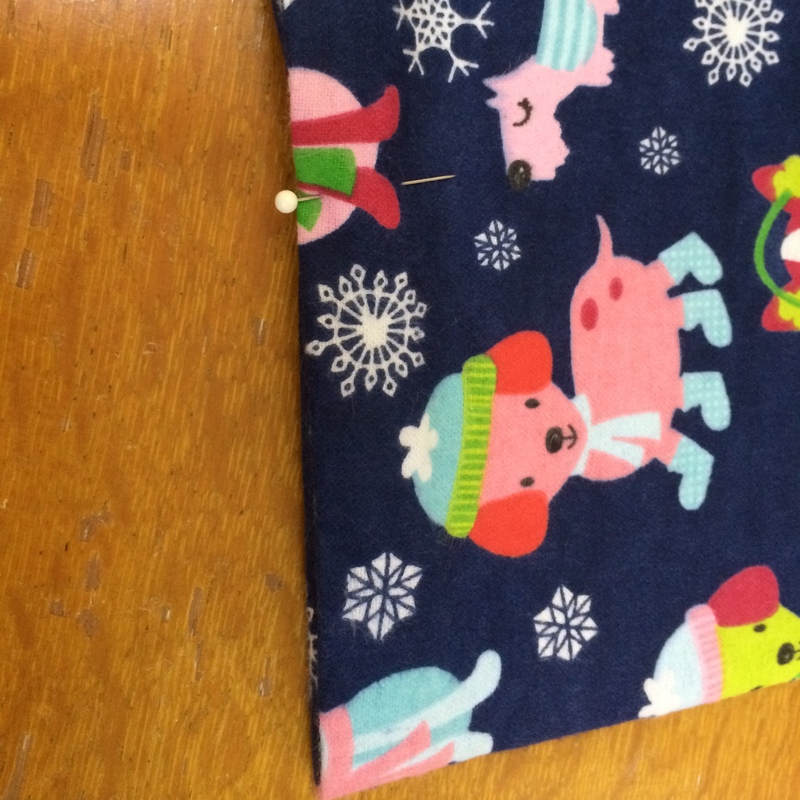 The fabric is 54″ wide, but since at the time I didn’t know what pattern I would be using I purchased 10 yards. Lucky for me, this overestimation was a good one. 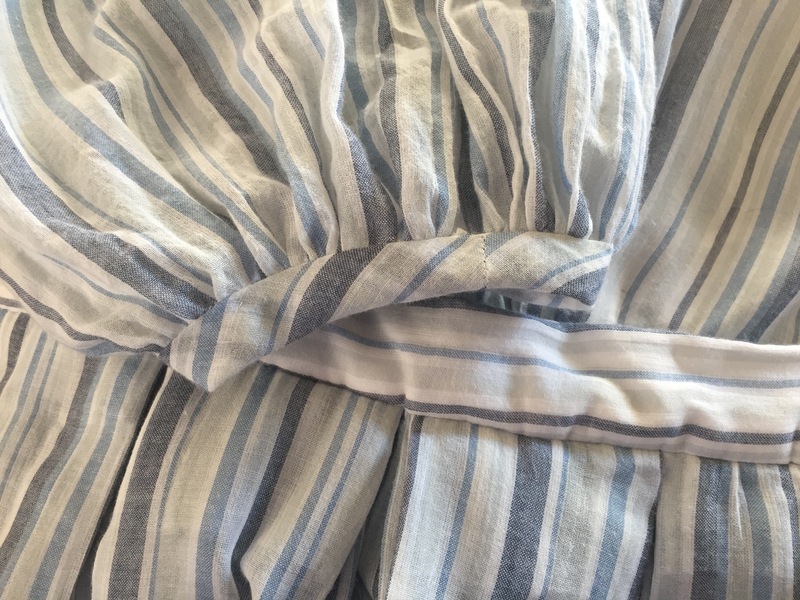 The sleeves on this dress are full and wide, plus since my fabric was directional, I was able to cut the stripes going from shoulder to wrist. Anyway, before any of that, I calculated my measurements and pattern size following the instructions on the pattern. The thing about the TV patterns is they allow you to custom fit your garment before you even start sewing. 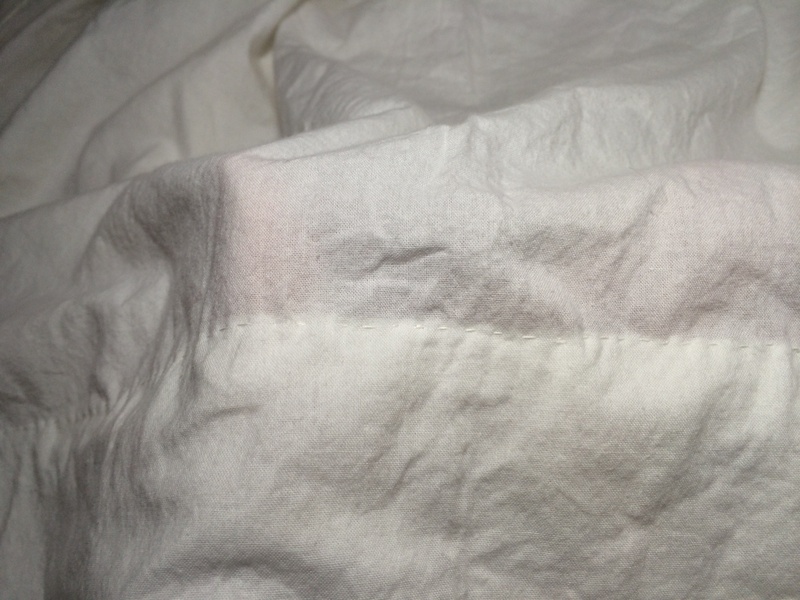 And once you do that, you can easily make up a muslin for a better idea on fit. Sorry this is not better quality, but almost all the mirrors in my house that are big enough are impacted by light diffusion. 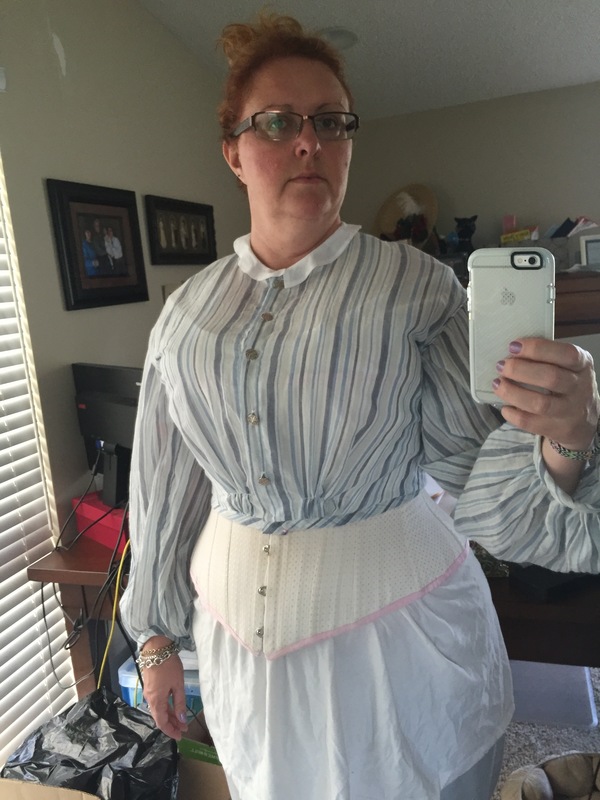 What I learned here is that the waist of the under bodice was a little too full but the bust was a pretty good fit. So I took in the darts a bit and retested it. I did not do this all by myself, by the way. I submitted my questions to the Civilian Civil War Closet group on Facebook for hints and help – there are clothing historians, professional seamstresses and experienced clothiers there who are willing to help for free. I just couldn’t overlook that knowledge base. I also asked my friend Shelley Peters for real world tips as she has made this pattern a lot. Had I needed it, the amazing Heather McNaughten at Truly Victorian would have helped too. As an aside, this just confirms for me that this community really wants its members to succeed! Anyway, after the changes to the muslin, I traced that as my new under bodice pattern piece and went forth to sew! This is the first time I have made my own bias and bias piping, which was used on the neckline facing and armscyes. I found the instructions sufficient, but had used better instructions on a Simplicity costume pattern and did that instead. They just made a bit more sense to my thinking, the result is the same. Piped facing to finish the raw edges of the under bodice. The construction of the garment is for the most part very easy. I found the TV method of inserting the sleeve into the armscye backwards to what I am used to so I just adapted and made notes on the pattern. I sewed this in a combination of machine and hand sewing. My fabric was so very delicate that even though I have a high quality machine, it sometimes would bunch up in the feed dogs. I wound up hand sewing much of the finishing stitching, such as on the piped facings, and also hand sewed all the button holes. 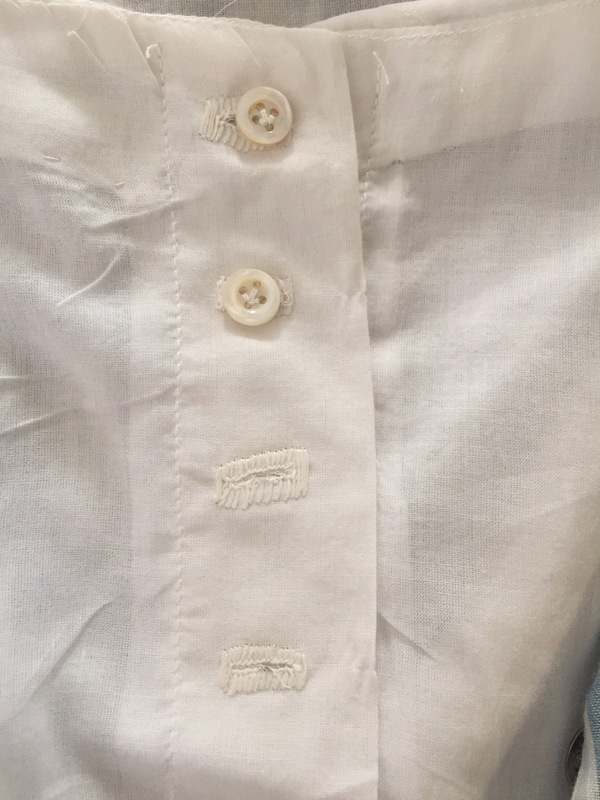 My reasoning here was twofold – I wanted historically accurate buttonholes and since the fabric was so delicate it was impossible for me to machine sew them to the standard I desired. I used silk thread for the buttonholes. The buttons are vintage shell buttons, much higher quality than the cheap flaked mother of pearl available these days. They were purchased through Farmhouse Fabrics. For visual interest I cut the sleeve band on the bias. Maybe there is a chance of this stretching over time, but the band is so generous around the wrist that I don’t expect that to happen. At this point, I went back to the Civilian Civil War Closet for help. 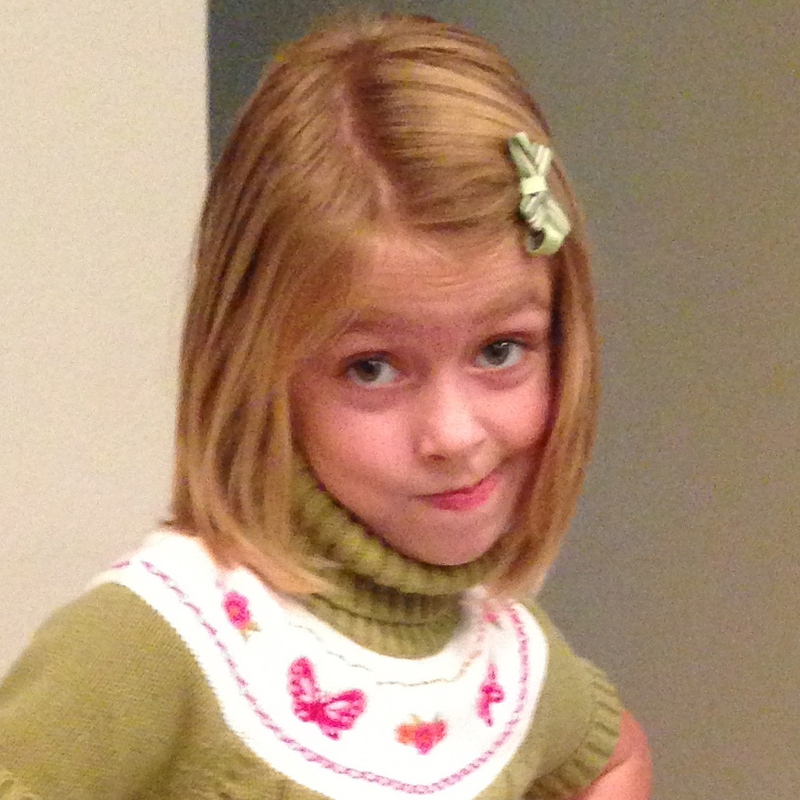 The pattern does not include a collar pattern. I don’t care for my look without a collar, so I googled for tutorials. The best suggested laying the pattern pieces for the bodice front and back together as though they were sewn, then tracing the curve from center front to center back, next extending that to a simple collar width. I did that, but found mine to be fluttery and off. 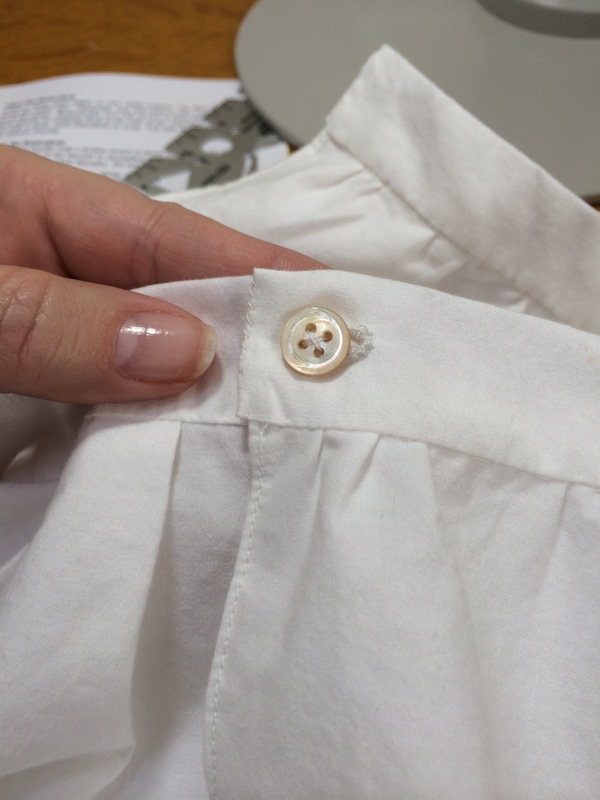 The amazing Liz Clark of the Sewing Academy helped me immensely with tips on how to correct this and redraft the collar. I’m delighted to say that I was successful! I added the fine tatted lace which I purchased at Farmhouse Fabrics. Next, waistband finishing. Since my fabric is 54″ wide, I didn’t want to cut it down to four 40″ panels to follow the TV skirt instructions. I retained the selvages as was done in historical garments, and used three panels instead of four. The skirt has a very deep pocket at the center left where the skirt pieces overlap with the waistband. Each panel was cut to the same length, but since your skirt front and skirt back are different lengths, there has to be a way to do this without cutting your fabric. Again, drawing on the Closet knowledge, I did as was suggested and folded over the waist edge of the fabric. 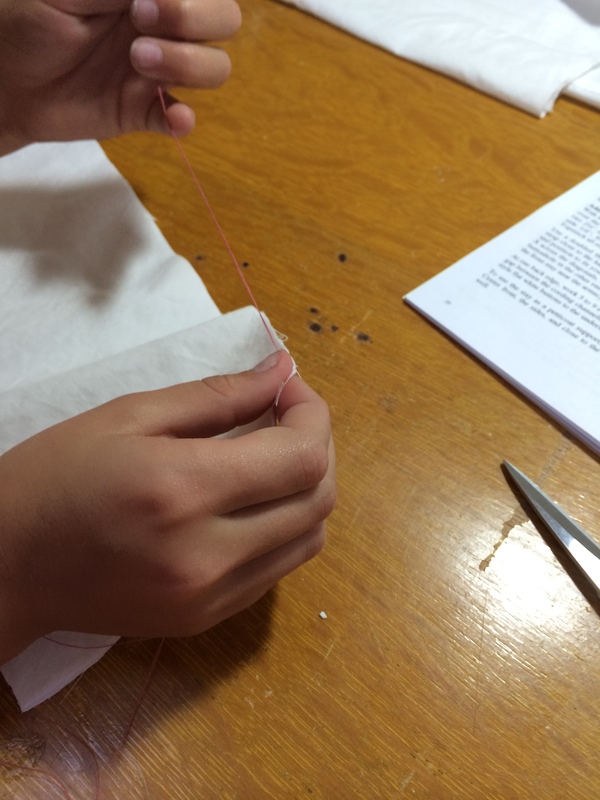 This gave added stability to the fabric as well as achieving the lengths needed. 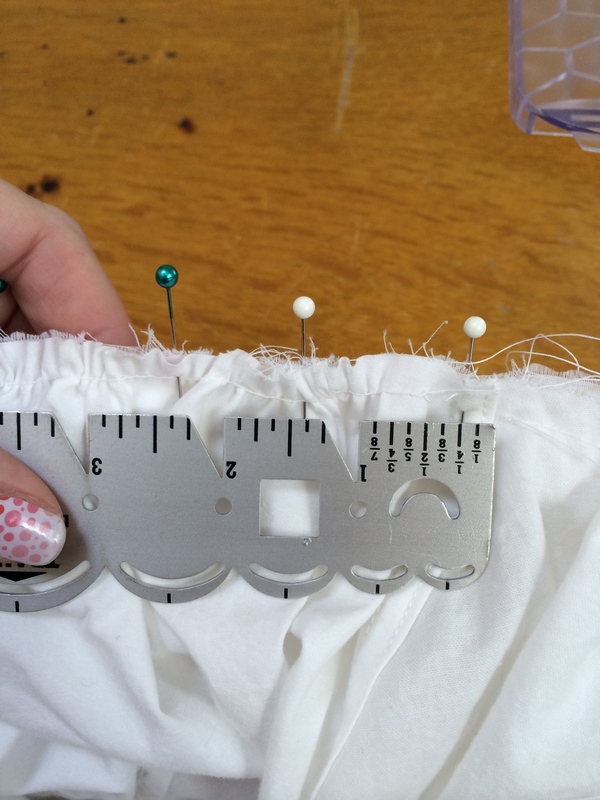 The pattern instructions have you cut your fabric at the waist to the desired angle which will give you your length. I don’t recommend that on a sheer just because of the off chance of it tearing. You can see in this very amateurly photoshopped picture the angle of the folded-over fabric. This is center back where the skirt is a bit longer than in the front. For the skirt attachment, the pattern gives you liberty to choose your preferred pleating or gathering method. Here I am showing you the double box pleats I used to pleat the skirt onto the waistband. Originally I had knife pleated the front and cartridge pleated the back, but I didn’t get enough fabric taken up in the front. So I went to the double box pleats in front and cartridge pleats in back. I’m quite happy with this look as it’s smooth and polished. I wanted to make sure that the hem folded straight up so the lines didn’t go off kilter, so I ended up hand sewing the hem. I used a single thread and every fourth stitch went through all layers. Every 8th stitch was taken twice to keep the thread from coming undone if it were to break for any reason. 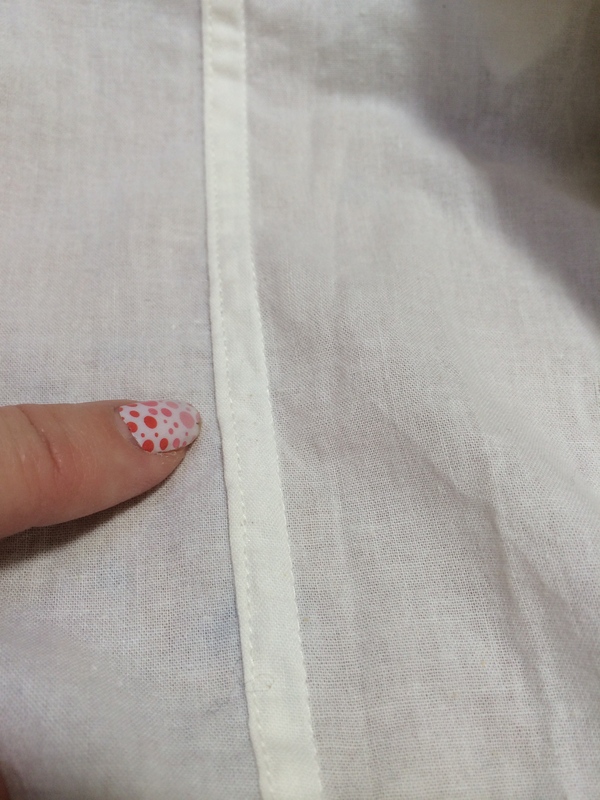 If you kept up with my thinking on the skirt width, you will realize that’s a 178″ hem. It took me a couple hours to do it. This is the finished dress, although it’s not the best picture of me lol. I’m looking down toward my daughter haha. Also, I realize that I must not have been laced as tightly in my corset as usual because I couldn’t fasten the waistband correctly. I wasn’t going to mess with it today and I’m certainly not taking the dress apart, so I’ll have to lace better next time. Here you can see the under sleeve just below my shoulder. This makes the dress very cool and airy. I had considered adding a silk stripe down the sleeve for interest, but I decided against it as it might weigh down the fabric. I may make a belt, as the silk I have is the exact color of the darkest stripe in the fabric. You can also see the shadow of my petticoat under the skirt. 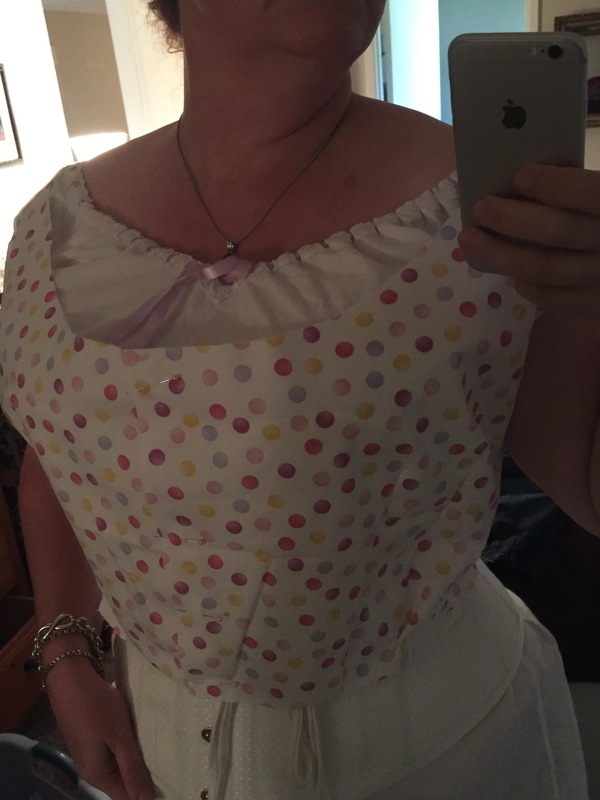 I have an eyelet petticoat with two large pleats in it. This isn’t an historically accurate petticoat and someday I will make a plain cotton one, but for now this is quite pretty. Overall I am thrilled with the result of the Truly Victorian TV447 Sheer Dress pattern. The instructions were easy, but true to the sewing techniques available to our ancestresses. It is not a pattern for a beginner, certainly, but if you have some knowledge of sewing, you can make this pattern truly customized to your preferences. If at times the instructions don’t make sense, just take them one sentence at a time. My mother told me when in doubt just do what the instructions say. These patterns will not take you down the wrong path, trust them and you will get something incredibly beautiful. And of course, email them, ask your friends who have made the pattern, or google for help. Truly Victorian patterns are very popular due to them being among the best on the market today, so lots of people make them! 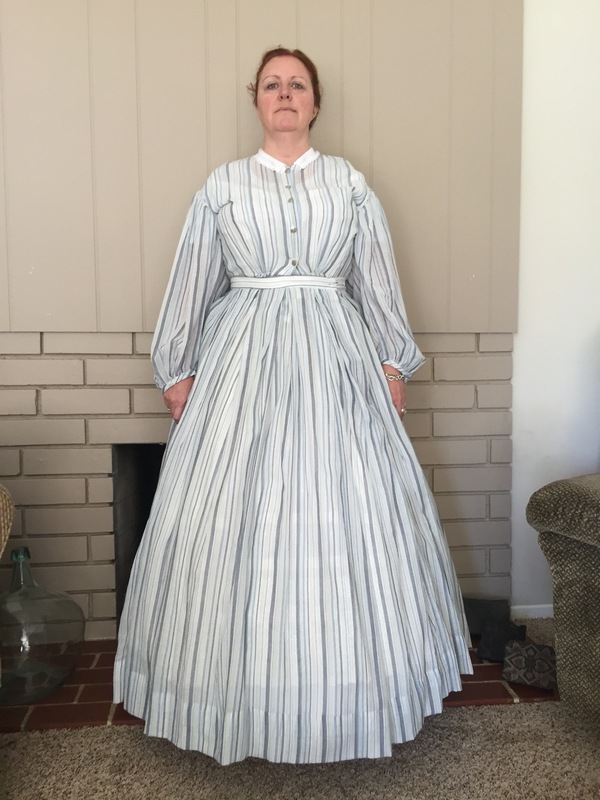 I am eager to wear this dress to one of our hottest events coming up soon, Huntington Beach Civil War Days. Undergarments in the past, the sort of thing that covers your backside, were called drawers. 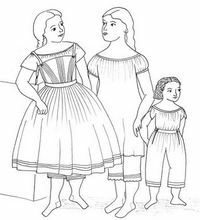 While I can’t find a definitive source, most people are speculating that long underwear type garments were called drawers because they were drawn up the body (as in drawing the curtains closed, drawing up your chonies). 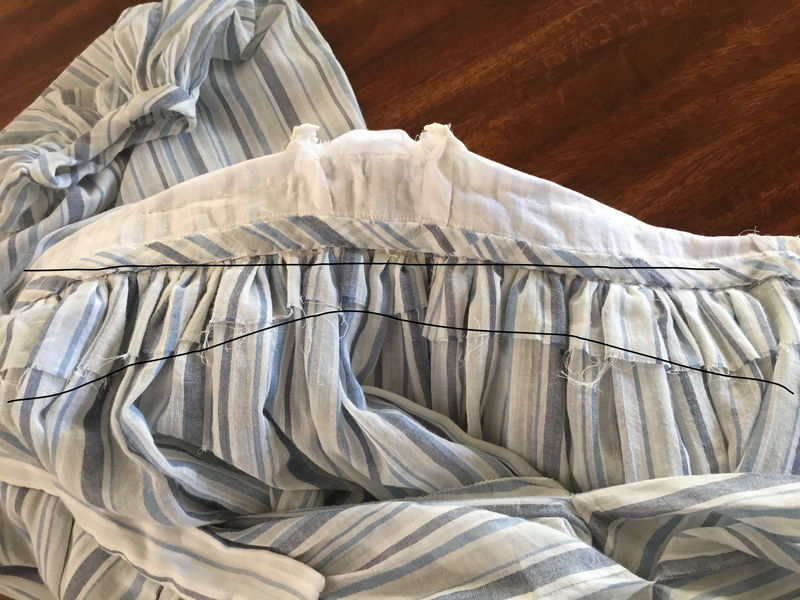 At least since the later 1500s, drawers referred to what we now call interchangeably pantaloons, bloomers*, underwear, pantalettes, underpinnings, unmentionables, linens, etc. During the mid 19th century, they were called drawers, and so that is what I will be calling them here. 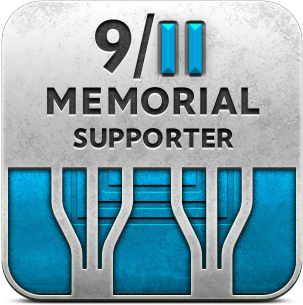 The item was designed to keep a person’s legs covered, both for modesty as well as cleanliness. Typical drawers for girls reached to the mid calf. 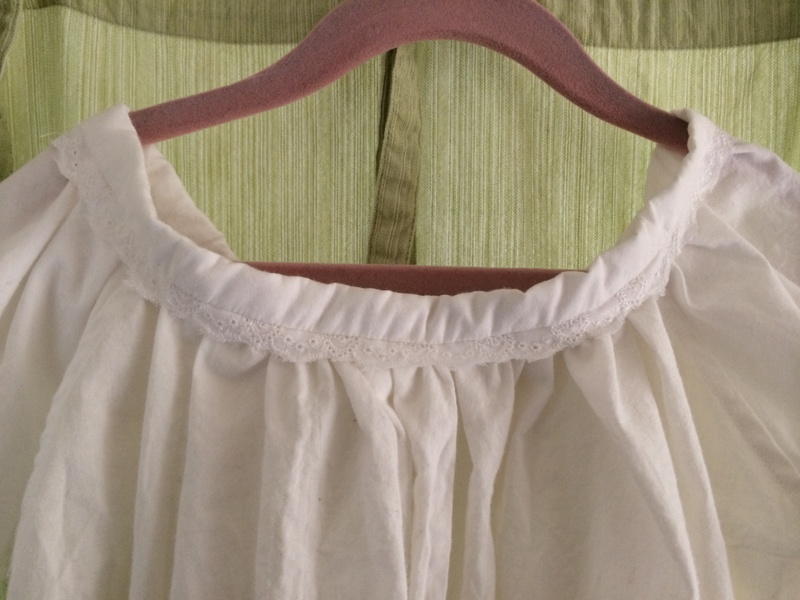 For my Mid Century Sewing Project, previously I made the child’s chemise, and almost immediately went onto the drawers. The pattern consists of one piece cut twice on a fold, and then a small portion is cut away from only half of it, creating a distinct left and right leg. 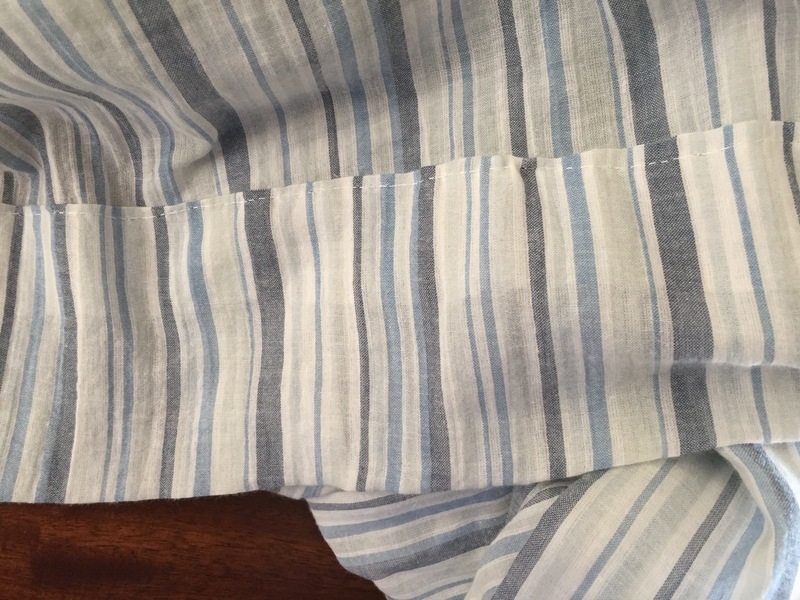 Since I had surprised myself in enjoying the hand sewing so much making the chemise, I decided to make the drawers in a combination of hand and machine sewing. Around the crotch area, I hand sewed the seams and felled them so they would not ravel. I chose to make closed crotch drawers for Melody’s modesty. The legs came together so easily, I hardly need to explain anything. My only caveat is that if your child has hips wider than the waist, you will want to cut the pattern to the hip measurement, not the waist measurement. You can see in the picture above that although these drawers fit Melody, a bit more ease in the hips might serve her nicely. Next I added the growth tucks. I put in three tucks, and it should be noted, I lengthened the pattern by 3 inches in order to have the tucks! This girl is tall. :-) I did not add any embellishment to the hem of the drawers. The pattern suggests white embroidery in between the tucks, but my embroidery is laughable at best! Auntie might be playing with this at the next event we do together haha. 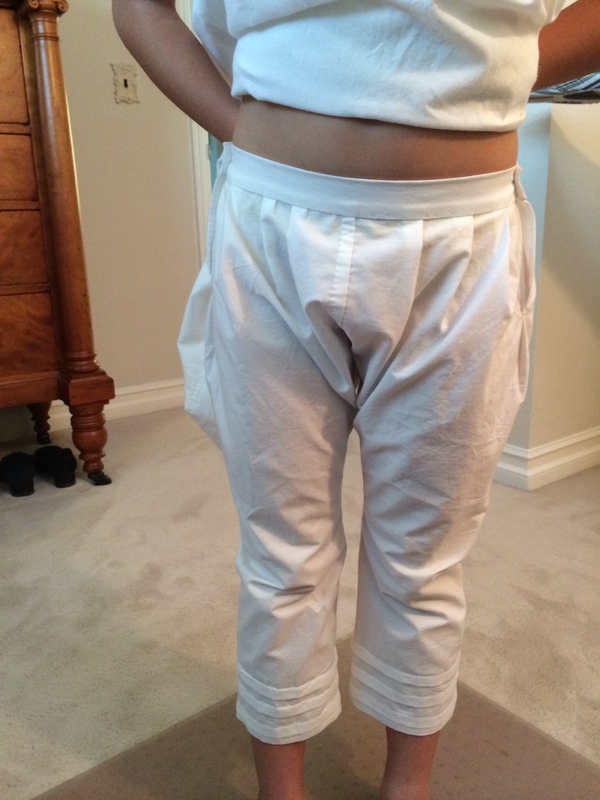 Once the side seams and plackets were prepared, I attached the waist bands. The drawers have two bands – a front and a back – which button together at the sides. For the front treatment, I pleated the drawer body onto the waistband for a more flat front. On the back I gathered the fabric and also decided on a semi-adjustable waistband. The semi-adjustable waistband is made with a short drawstring inside so the band lays relatively flat, but can allow for a bit of ease. Although the pattern called for cotton tape as the drawstring, I didn’t have any so I used cotton cord. 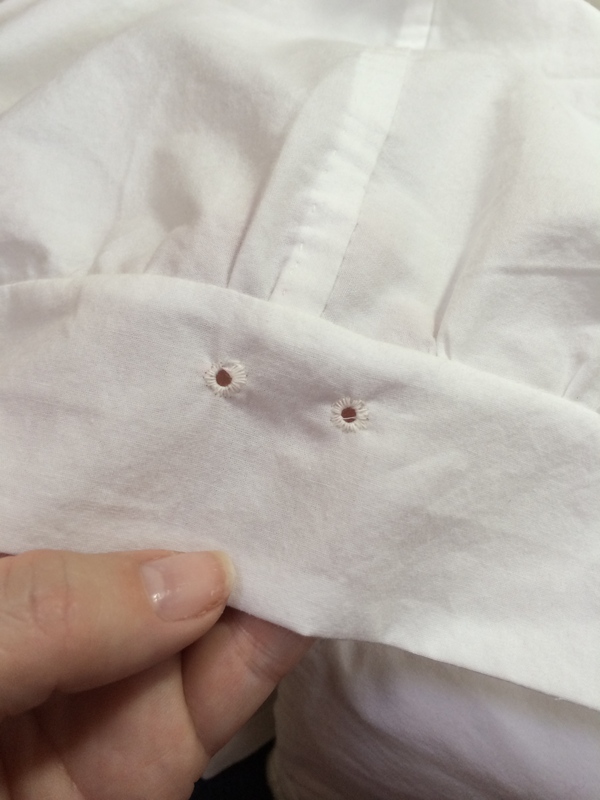 Also, I learned how to make hand stitched eyelets! These were easy and look so nice. Here I chose to bind the ends of the cords with thread. 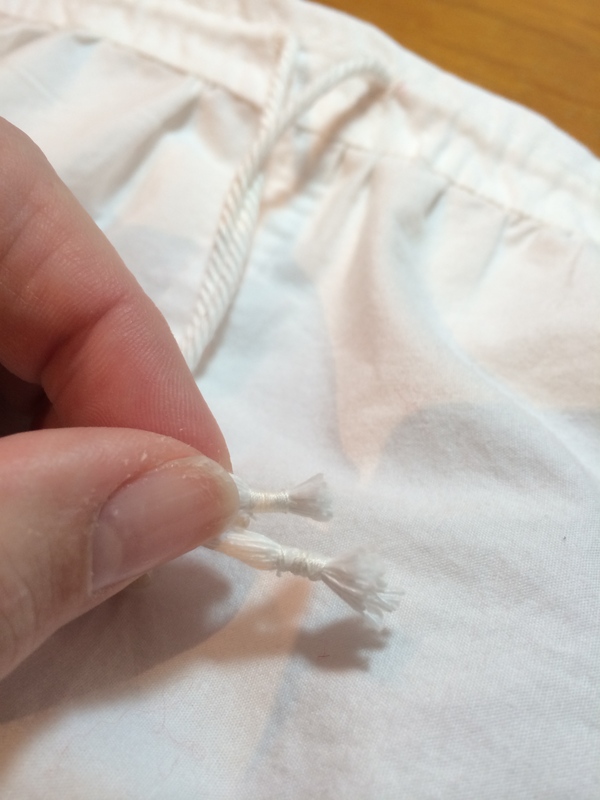 Since it is cotton cord, it can’t be warmed to create an aglet. But also since it is cotton cord, I didn’t want it to unravel. Once this was finished I went on to learn how to sew a buttonhole. Mine are not quite attractive yet, but they are functional, heh. I found in my stash two nice 1/2″ shell buttons. Perfect! Modern mother of pearl is so thin, but these will be sturdy for use by a busy little girl. 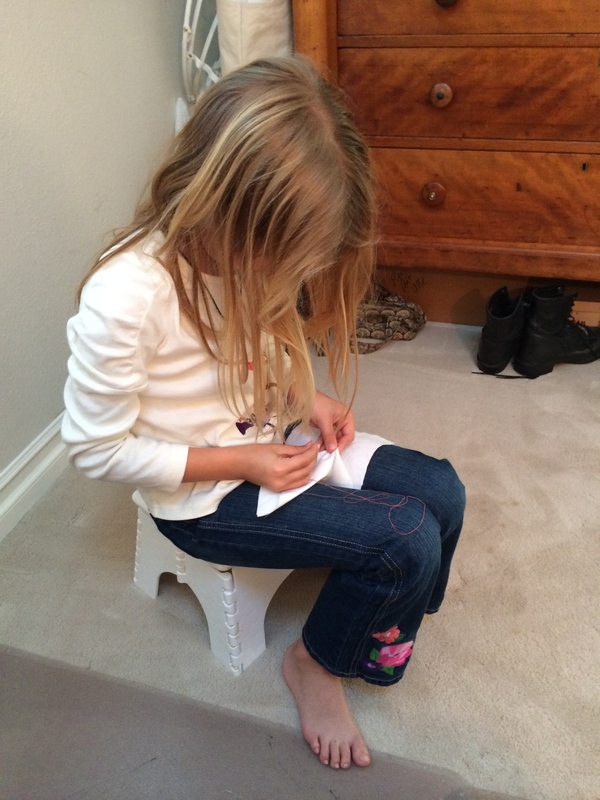 Around about this point, I was asked to give Melody her first sewing lesson. 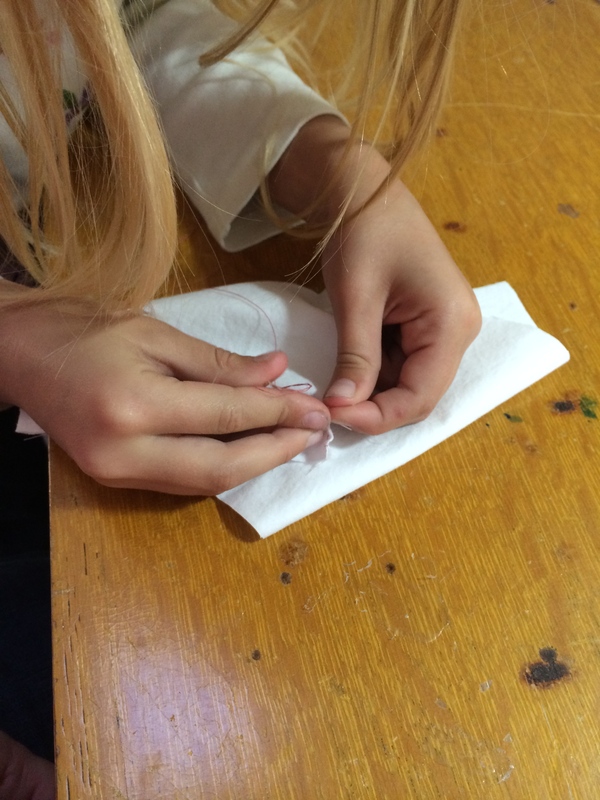 I am delighted that she is interested, and she did a great job for her first attempt! Finally, the drawers are finished. Here they are paired with the chemise and a child’s cage that I picked up second hand from another reenactor. The cage is from the Originals by Kay line and are known to be historically accurate. I have to make a minor alteration to it. The previous owner added a button & buttonhole, but it’s a bit snug for Melody’s waist. So, I’m adding a short extension to cover and strengthen the previous buttonhole and give us another inch on the waistband. Next up will be the stays. Melody asked for them specifically, and I figure if I’m going to do this, I better do it right and how she wants it! 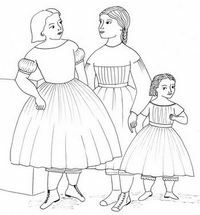 * Bloomers in the 19th century were a type of pants, not drawers or undergarments, that were worn underneath skirts, and touted as a progressive manner of dressing. They were originally introduced in the 1850s by Elizabeth Smith Miller, and based on the harem pants and other types of loose trousers worn in Asian countries. Mrs Amelia Bloomer popularized the garment through her own wearing of them as well as advertising and writing about them in her newspaper. She was also known as a “radical” because she believed women should have the right to vote in national elections and that alcohol should be outlawed. And she was radical for her time! She owned a newspaper specifically for women; she served on the Iowa Suffrage Committee; she was friends with other reformers, such as Elizabeth Cady Stanton and Susan B. Anthony. Mrs Bloomer helped women take on the rights we all enjoy today. I have finished the first installation of practice on the Mid Century Sewing Project as I referenced a couple posts back! 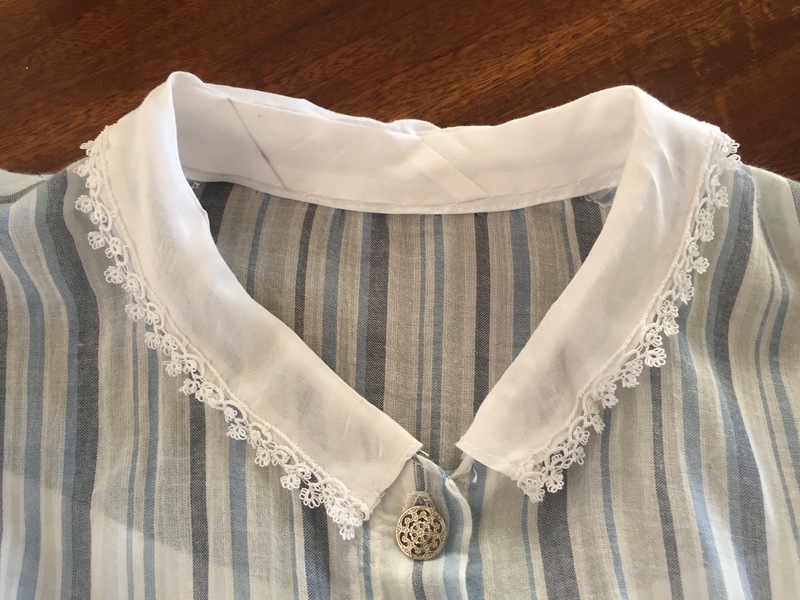 The first item I decided to try was the child’s chemise from the Elizabeth Stewart Clark’s Historic Moments Girls Linens 1840-1865 pattern. While the pattern comes with a 30 page booklet, do not let this intimidate you, as it did me at first. 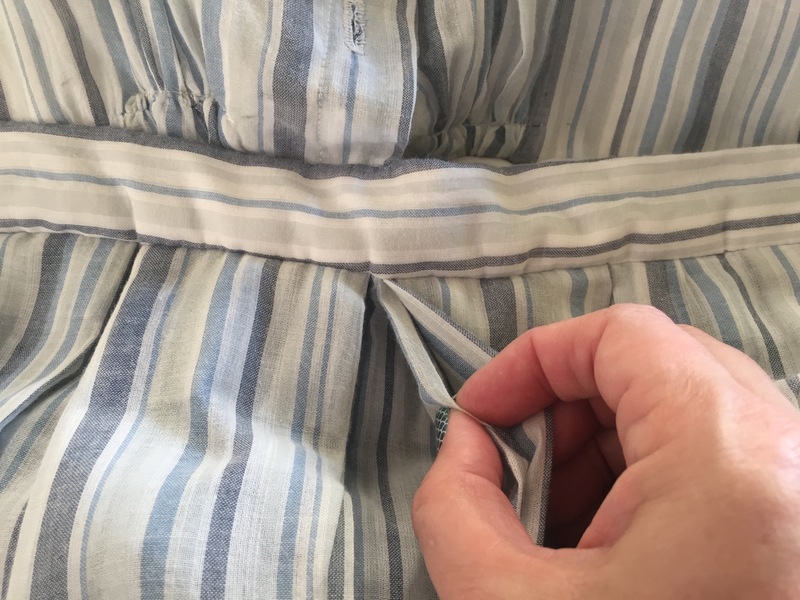 It is packed full of helpful tips on making your garment as period correct as you want or can, plus complete instructions for three garments with a variety of options. I am glad I made this as a practice run because I made a few mistakes and some decisions on construction about half way through the project. 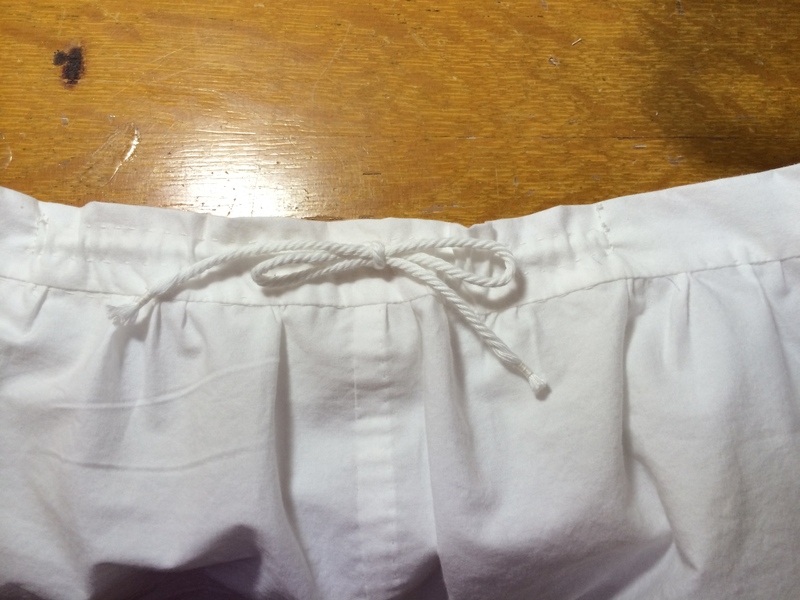 First off, I learned how to make the run and fell seam, an historic technique that encases raw edges inside a seam and adds greater strength to seams. 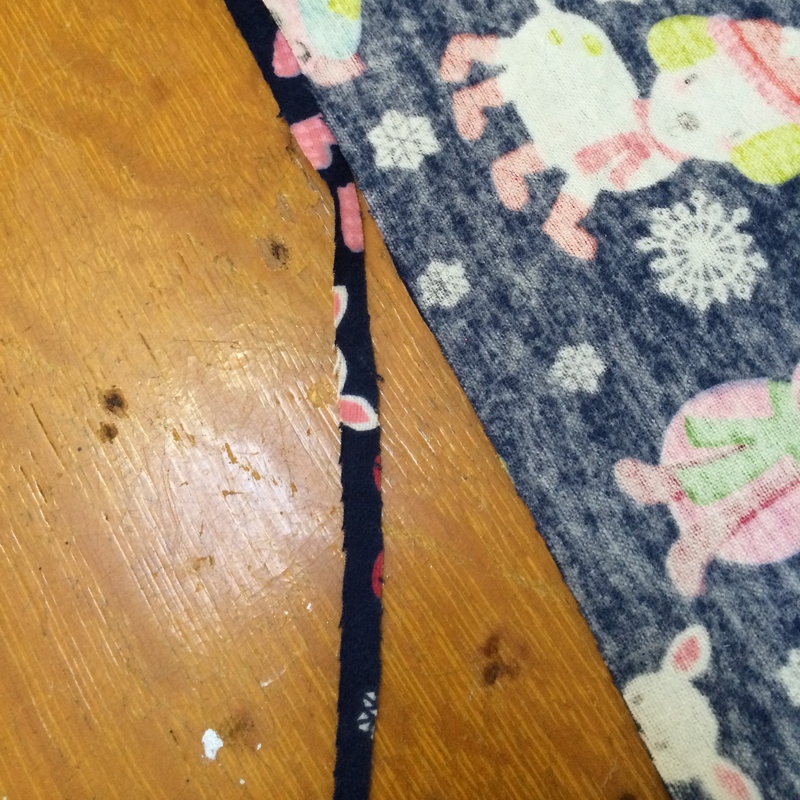 In the armscye area, I hand stitched the seam on one side and machine stitched it on the other. I must admit that I prefer the hand stitched side. 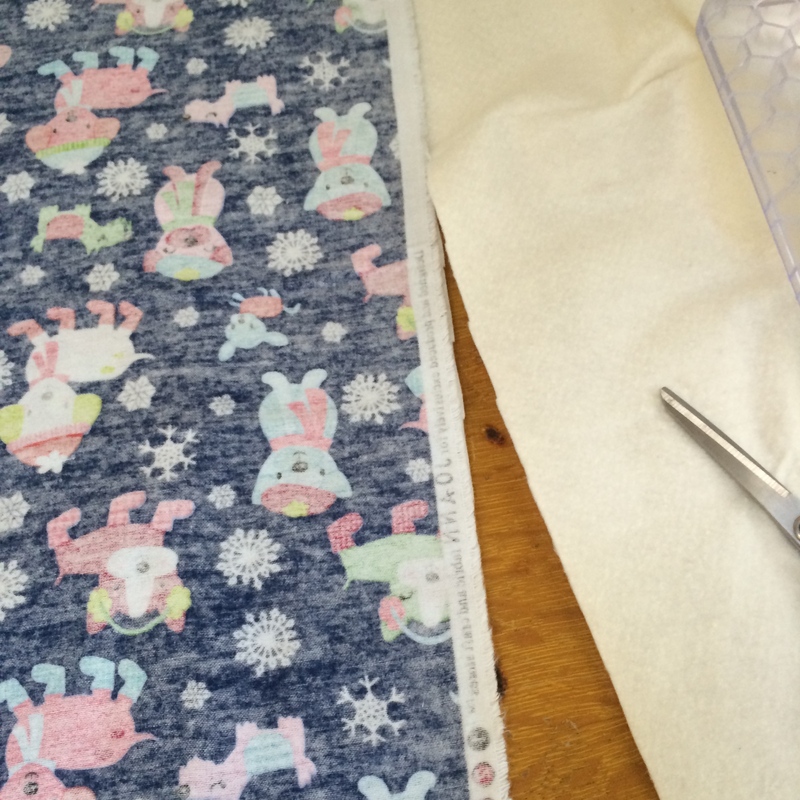 There is a little more forgiveness in hand sewing that you don’t get on a machine. I also found it easier to maneuver in the small area by hand. I stitched the side seams on the machine and they are very neat and tidy. I like that. On the sleeve, I chose to add a whitework border. 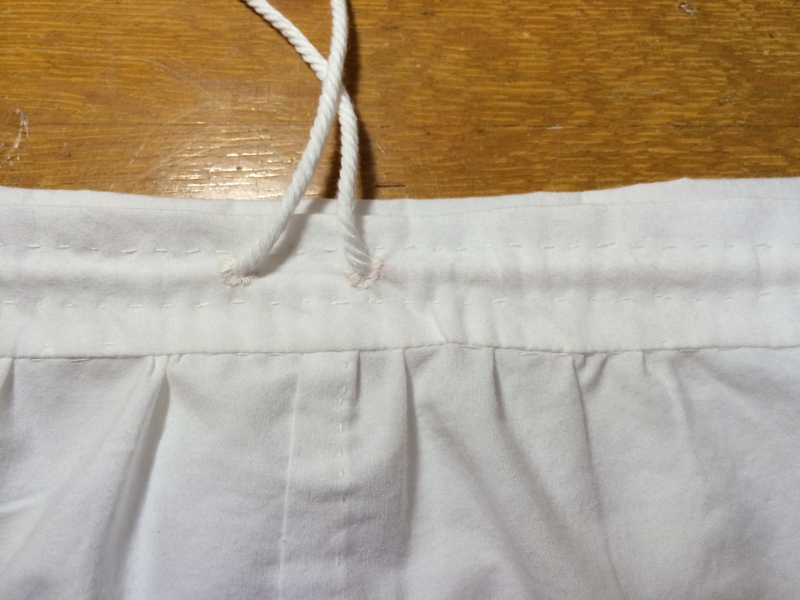 Pictured is the “cheap” eyelet from a local chain store. 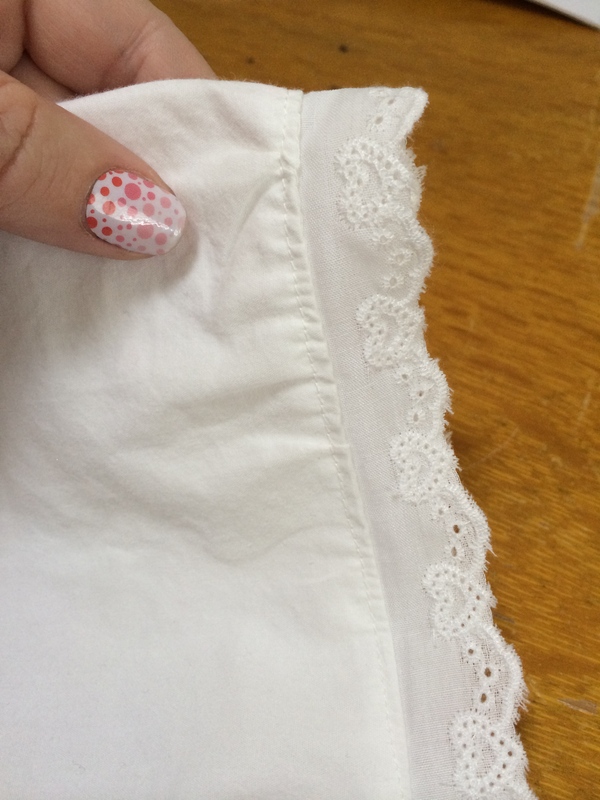 Even though I measured the opening carefully, I still found my eyelet border to be a tad smaller than the opening of the sleeve. I ended up taking some ease stitches over the top of the sleeve. I don’t like how that puckers there, and on the “official” garment I will measure even more carefully. 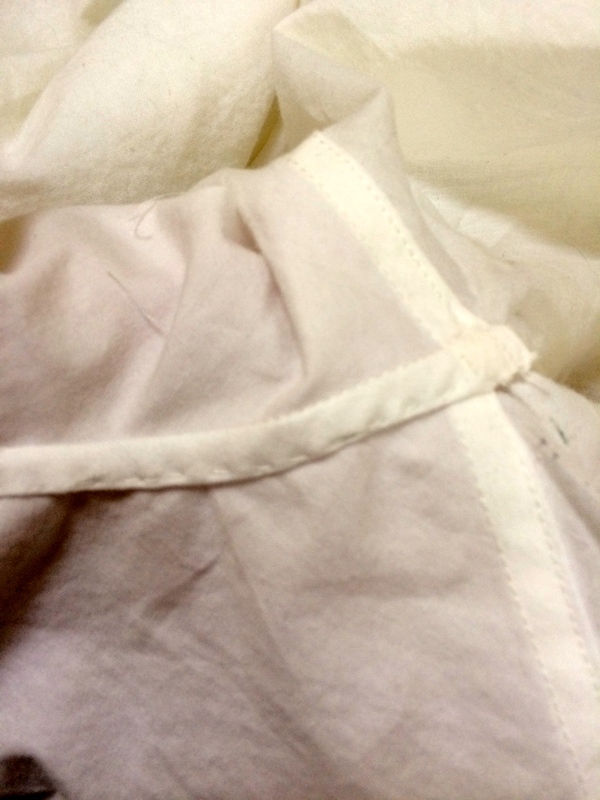 Once the sleeves are attached and the side seams stitched, the neckline is ready to be bound. I chose the fixed band option, which is a simple process of basically gathering everything and then binding it. There are no notches or dots on these patterns – something I really hate on Big Three patterns but which I could have seen the benefit of here. Once the band was placed at the correct location on the center of the sleeve, I wasn’t sure where the seams of the sleeve should fall. I took a reasonable guess placed the seam about 2 1/2″ to either side of the center point. Here is where my hand stitching really kicked in. Once the binding has been stitched to the outside, it is turned and then stitched inside. I took as small of stitches as I could and every fifth stitch I took another stitch right on top to prevent the work from slipping. 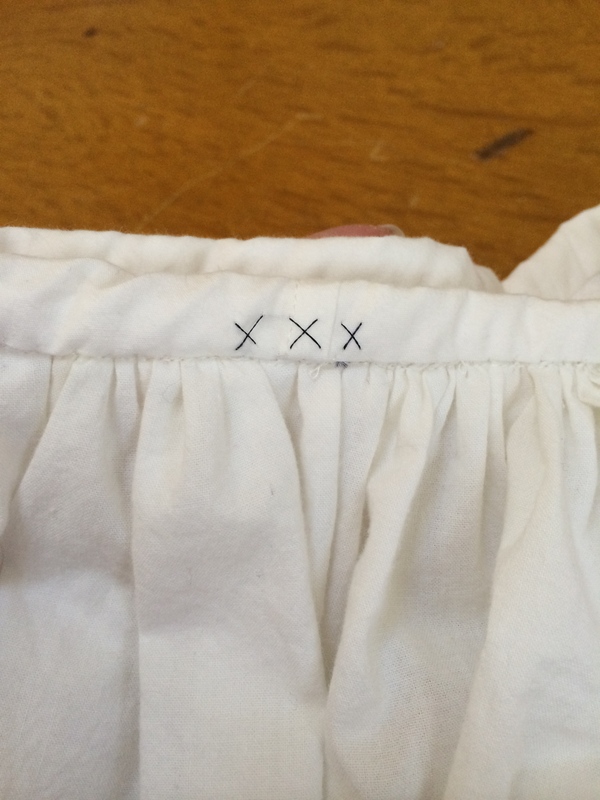 I added the 3 x marks because the chemise is identical front and back except for a small line on the neck band. 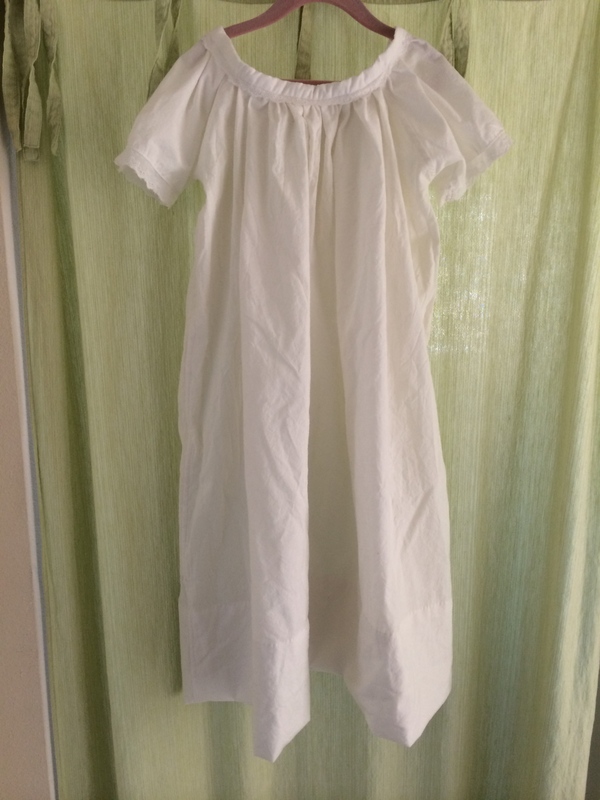 This will be Melody’s “every day” chemise, which she will use as early as the Vista Reenactment coming up in March! As you can see, this is a generous garment that should fit nearly any child comfortably. I am looking forward to making the drawers next. In fact, I want to go cut them out right now! Last year, my family went to the local county fair. 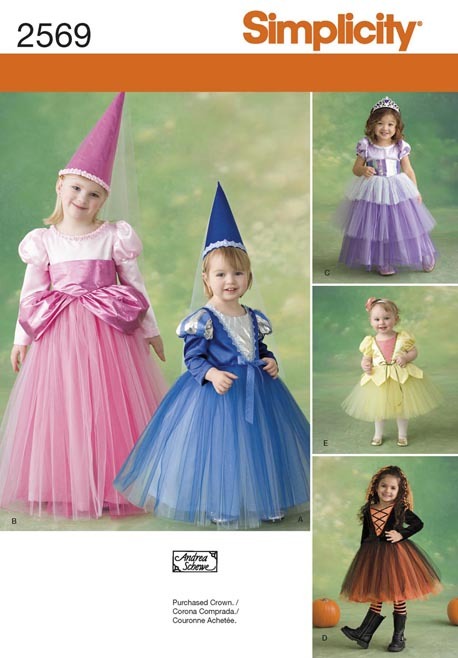 Of course, I always take a look at the sewing entries, and the costume entires. The items in last year’s display were……interesting, to say it politely. I’m a dedicated admirer of historical clothing and sewing techniques. Some of the “historical costumes” submitted last year were exactly that – costumes. There is a huge difference between historical garments used in a modern stage play about the Antebellum South and actual reproduction garments worn by history enthusiasts. To most people, the two types of clothing look identical, but to those of us who know, the disparity is drastic. It was at that moment, as I gazed on a silk child’s dress made by a competent seamstress in a completely inaccurate manner to replicate the look of a Colonial child’s dress, that I decided I would like to make and submit to the county fair a full set of clothing in period accurate materials with period accurate construction techniques. Um, what did I just say? 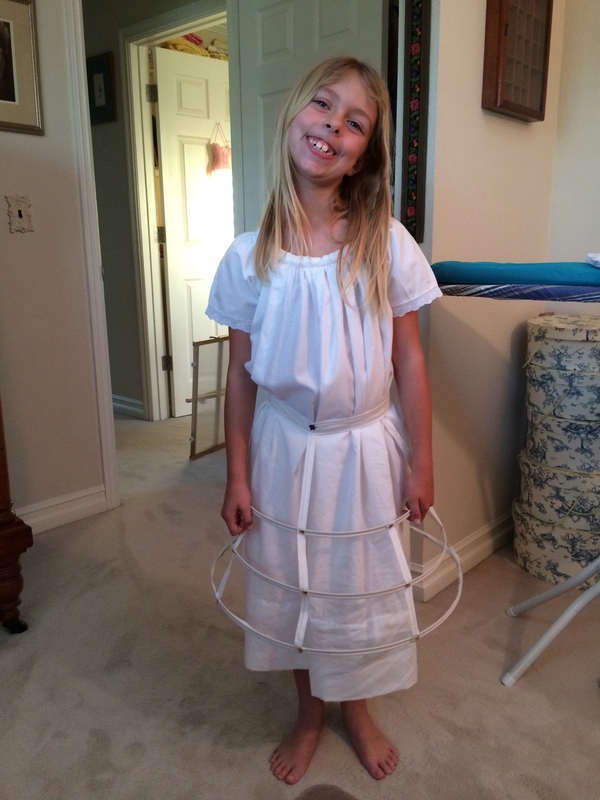 I’m taking on a project to create a mid-century (19th century for those who don’t know me well) party dress for my seven-year-old, made as though it came out of great-great-great-granny’s trunk after having been put away after the last big party, and then forgotten for 150 years. Girls Dresses (c) Elizabeth Stewart Clark & Co.
To do this, I will be following the techniques in Elizabeth Stewart Clark’s Historic Moments Patterns, Girls Linens 1840-1865 and Girls Dresses 1840-1865. 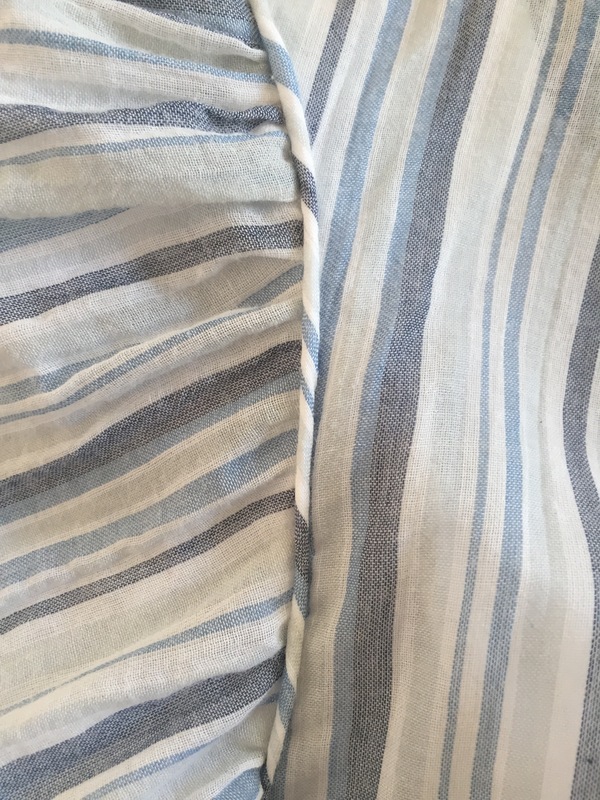 These two patterns were carefully researched by Ms. Clark to best represent the home sewing techniques used by most women of the era. There are various options for sleeves, necklines and trims that allow for styles across the classes – from poor to upper class. 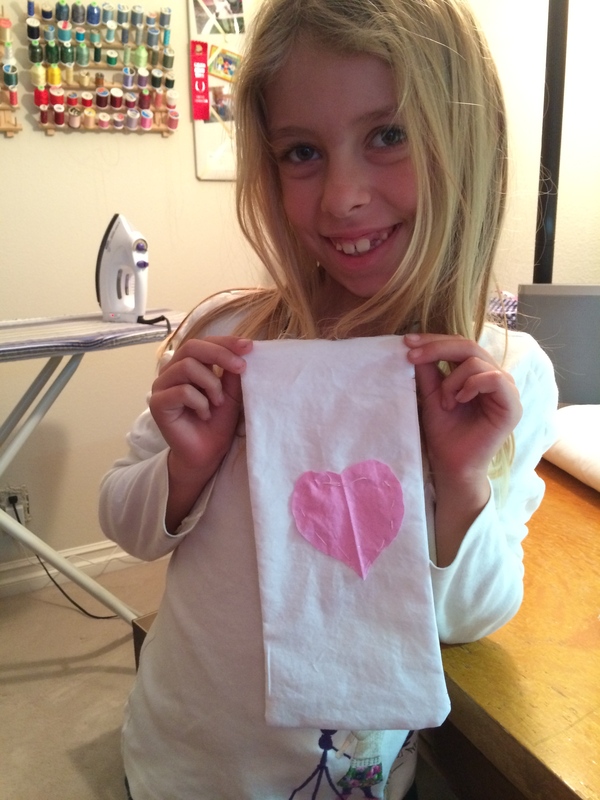 Girls Linens (c) Elizabeth Stewart Clark & Co.
Now, I have been thinking about this project since last August. 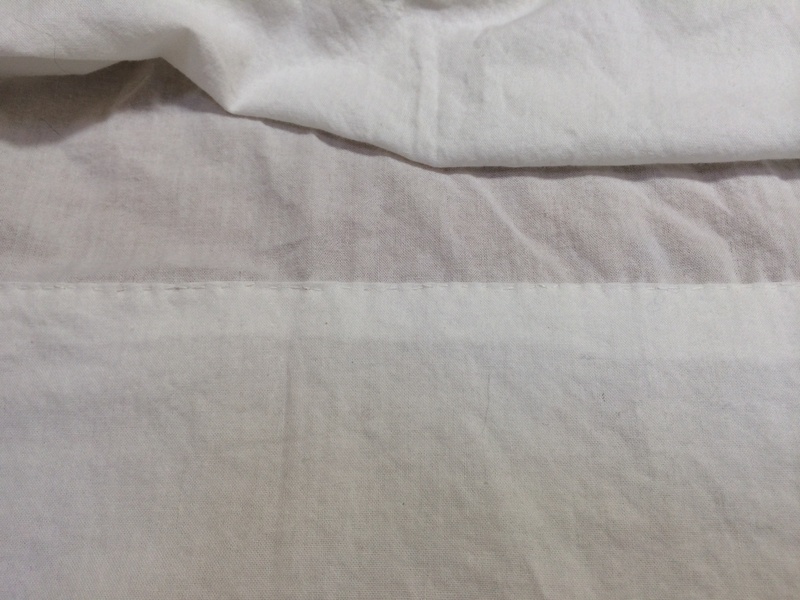 I have purchased white bleached muslin for the undergarments and two cuts of silk for the dress. Today I ordered fancy imported Swiss embroidered edging. I got out the pattern and read through the booklet. It’s a tiny bit intimidating when your pattern comes with a 30 page booklet of construction tips and instructions. But, this is one of the best patterns on the market, and I hear wonderful things about it, so I’m going to roll with it. I took Melody’s measurements tonight. I have always said she is tall and lean! Her measurements fluctuate between three of the sizes in the pattern and one measurement isn’t even on the chart it is so small. 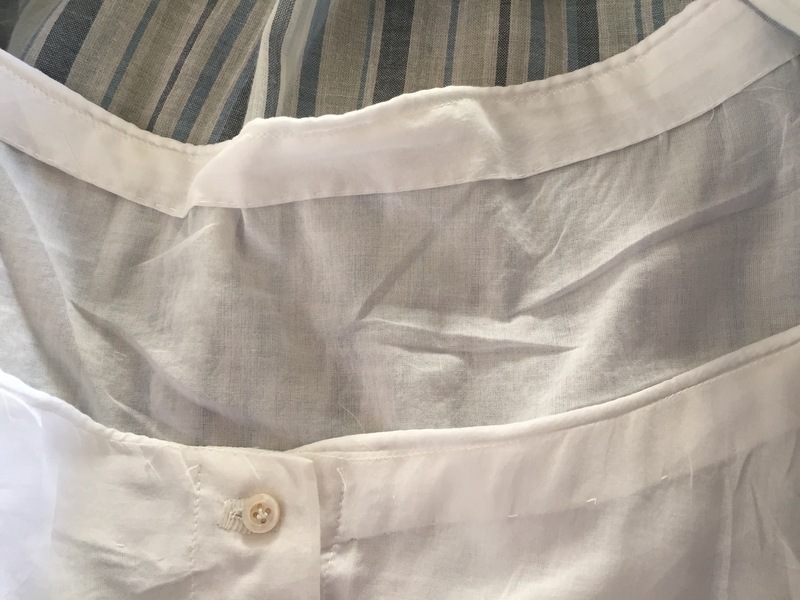 Her chest is between size A-B, waist is not even on the chart for A, BNL between B-C, Neck between A-B and arm between B-C. Sigh…I will have to make a muslin and do some alterations, I suppose. I expect I will start working on this soon as I’ve only got a few months before it must be turned in to the fair committee. Watch for updates as I proceed! And wish me luck. Lots of it! Even your smallest members of the house need a lovey, right? 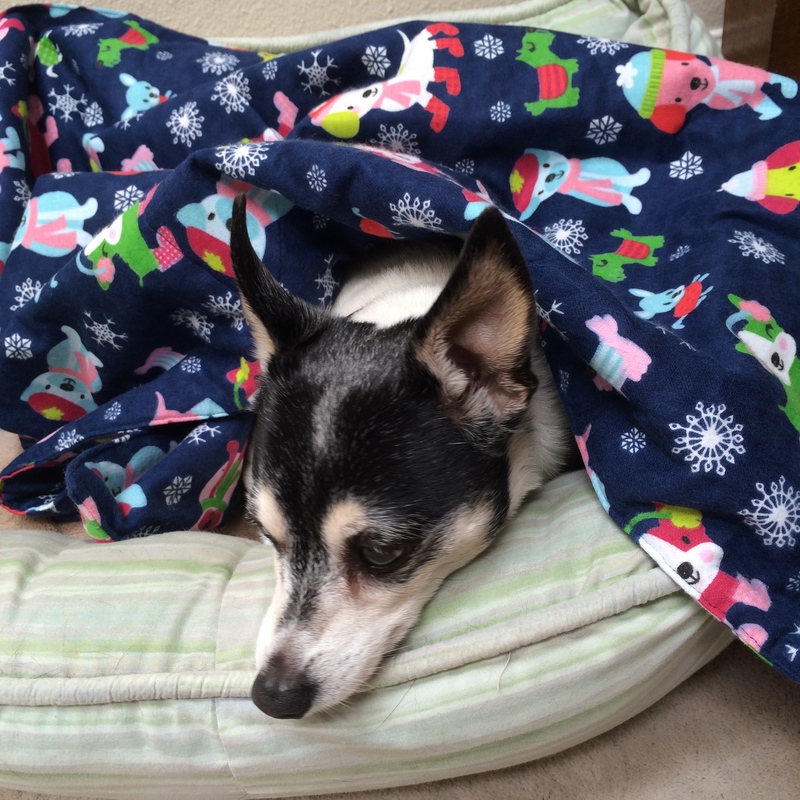 I have been making these blankets for my cats and dogs for many years. My mother made them for the family dog when I was growing up. 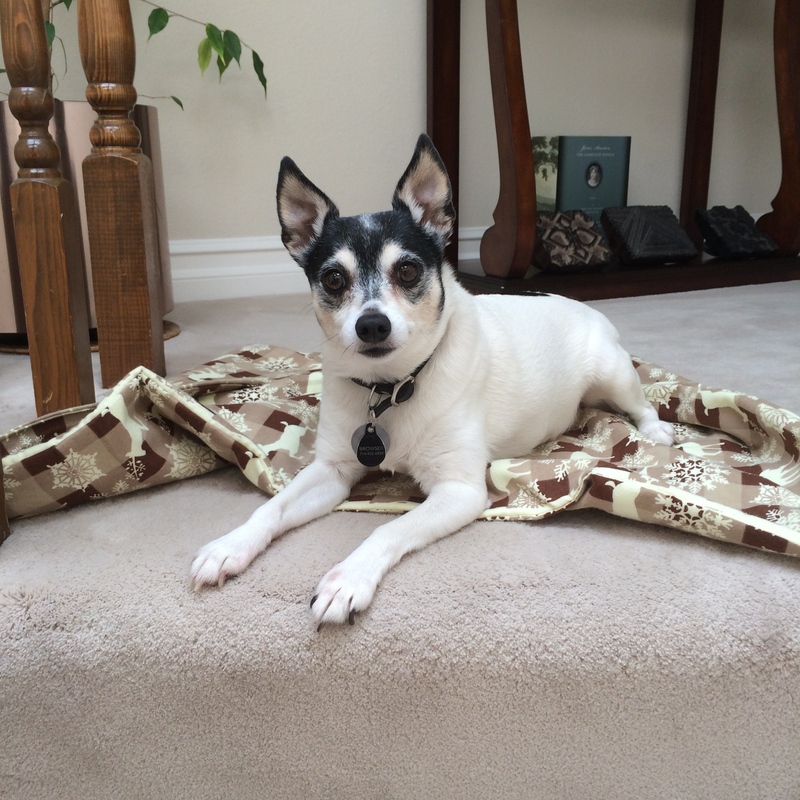 They can be placed around the house where your pet likes to sleep, they protect your light colored carpets and linens from dark colored hair deposits and pet “gunk”, and can make it so your pet can sleep on the bed without being right up in your face. 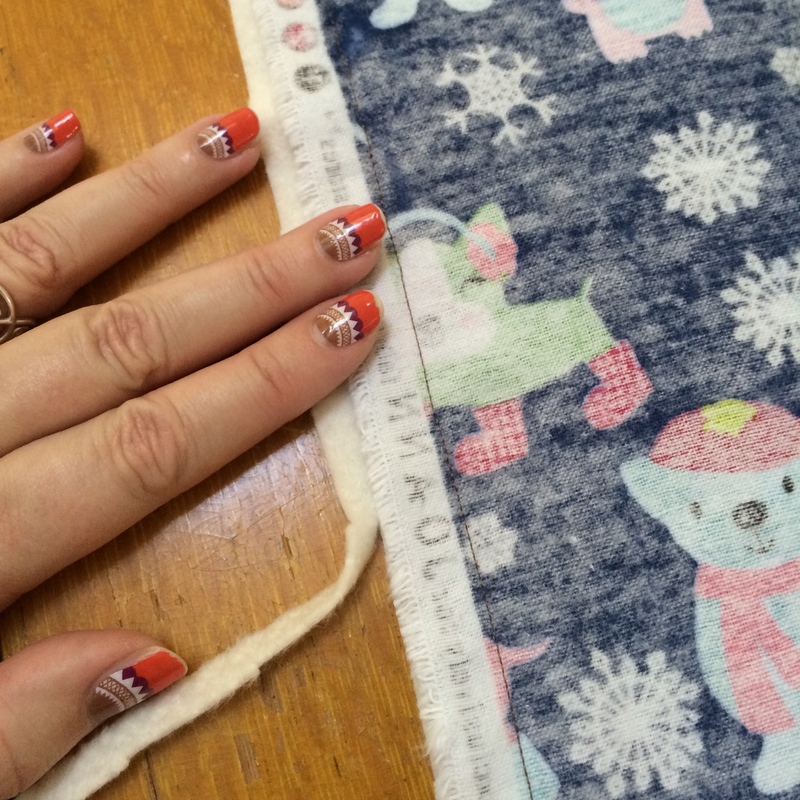 Lay out the fabric to make sure the edges are even and straight. Trim where necessary. Lay the batting on your table, then lay the fabric on top. Match the edge of the batting to the folded edge of your flannel. The flannel is going to be your guide for cutting. Cut out the batting. You should now have one yard of flannel folded inside out and then layered on top of the batting. Keeping everything configured exactly like that, stitch around the open edges, leaving yourself a 6″ opening where you will turn the fabric. Backstitch to anchor your stitching. Before turning, trim any edges. Turn your project by reaching in through the hole and grasping the other end. Pull everything through the hole. Once it’s right side out, reach back in and pop out the corners. Next, turn in the raw edges at the opening, pin closed, then stitch. Present to Fluffy and collect the furry gratitude you are owed for your efforts. Start to finish this project should take about 15 minutes. Our 19th century counterparts were very good at using every resource until it was completely used up. They didn’t have a local Walmart or Target available to run over and buy a replacement. Stores were sometimes a full days ride away from home, and so they stocked up on certain things, and used and reused things diligently. In their day, it was called “being frugal.” These days we have rebranded it for school kids and we call it recycling. 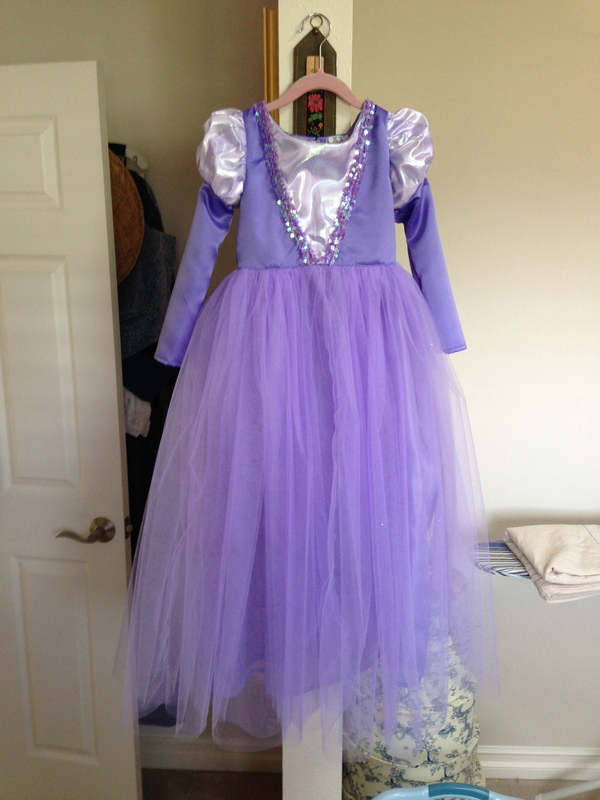 Melody asked me to make her a purple princess dress for her birthday, since we are having a princess themed birthday party for her upcoming 6th birthday. We looked at different pictures, I assessed just how crazy this might be, and went over to Joanne’s to buy fabric. Melody selected view A, which is the blue one shown above. The pattern calls for many yards of tulle and satin, plus some tissue lame for the inset and sleeve puffs, and a little trim. Right out of the gate I ran into difficulties, because Joanne’s had two completely different lavenders – one a pink lavender and one a blue lavender. After much deliberation (no joke, easily 30 minutes) I decided on the blue lavender. It just has a more of a true lavender look to me, besides the fact that Melody already has a Rapunzel dress that is in a more pink lavender. Next, I was thinking of using an embellished chiffon in the collection in place of the top layer of tulle, but Joanne’s had exactly 1/2 yard too little. Once that obstacle was overcome, the cutter discovered that they had exactly 1/2 yard too little of the coordinating lining fabric. Anyway, I’m flexible, made some adjustments then went home to get this project started. I had selected an iridescent sheer instead of the tissue lame because they didn’t have a silver lame, only gold and it didn’t look good with the lavender. Let me just say, I am pleased with the results but I really regret that fabric. It was very slippery. I backed it with white satin, flatlined them and treated them as one piece. The pattern has you apply this triangle shaped piece to the bodice front in the first step, fine. But upon reading through the pattern, they have you glue the trim on at the end. That didn’t work for me because I know my daughter. That trim would be ripped off within the first day. Here’s my second regret about this dress. I picked out a really pretty sequined trim that matched the fabric perfectly; it was sold by the spool so I couldn’t open it in the store. It was elasticized! And the sequins are made from something stronger than titanium because I broke three – yes three – needles stitching it on. Now I understand that Simplicity wanted the trim to lay on top of the seam because after sewing, turning and finishing the bodice I can see that part of the trim tucks inside and it’s not a “perfect” look. However, if you use something that doesn’t have sequins, why in the world would you not sew it on? A regular ribbon or floral trim is going to be just fine stitched inside the seam and it will be a much more finished look. So there. The rest of the dress was so easy! The puffed sleeve is a two-part sleeve, meaning you cut a small piece out of the tissue lame (or slippery annoying iridescent stuff, in my case) and apply it to a regular sleeve piece. 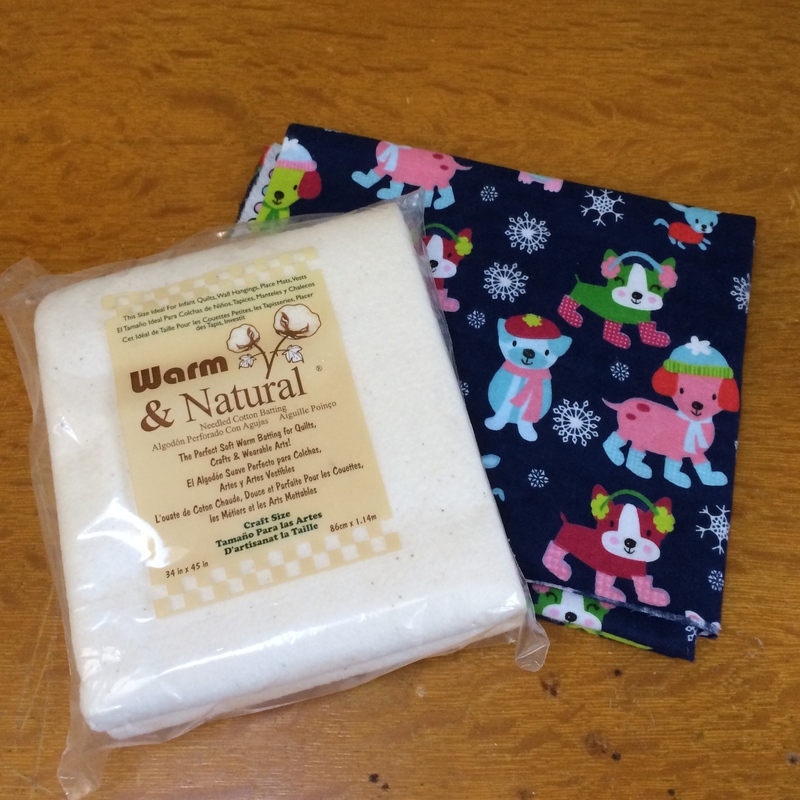 The gathering of the fabric gives you the puff and it is really very easy. The skirt is two layers of tulle plus an underskirt. My only thought is that you really want to use fine tulle here because a rougher one might be a bit scratchy on the inside. Also, the waist is finished by turning the seams toward the bodice and top stitching. With the horrid titanium sequins I had going on, I did not top stitch that section. I found the directions for the back opening a tiny bit confusing. They have you extend and press back 1/2″ of the tulle on the center back, but it is unclear as to exactly where it is to be placed. Looking back, I can see now it was supposed to have been folded back and placed along the zipper placement line, not the raw edge. This would allow for there to be a gap in the tulle allowing the zipper to pass through nicely and the stitching to be neat and tidy. While you won’t be able to find it on this dress, I had to do some fancy zipper foot work to make that spot work. With those two minor criticisms, however, I’d say this is a nice pattern. It’s not a beginner pattern, but certainly not an expert level either. But, what do you think? It fits well and I made it large so she can wear it for more than a minute. I haven’t made the hat. I’m considering going back and making one of cotton for a certain little girl who’s birthday is in July.